BEADING RULE # 204: Do not attempt to use super-glue at 1:20am in an easy chair with your feet up! I am not KIDDING! I was finishing up the above necklace, minding my own business when the super-glue attacked me! well, OK, heres what happened. For those who do not frequent the email group beadtalk, the PCB stands for Prayer Chain Beads. This was a wonderful project headed up by Mary Beedles where as many as possible members send in 400 beads after praying over them, instilling them with good wishes and healing power. Close to 200 people participated in this project, and I wanted to do something special with the beads, hopefully using as many of them as possible. When I first heard about the project, I immediately thought prayer shaw. 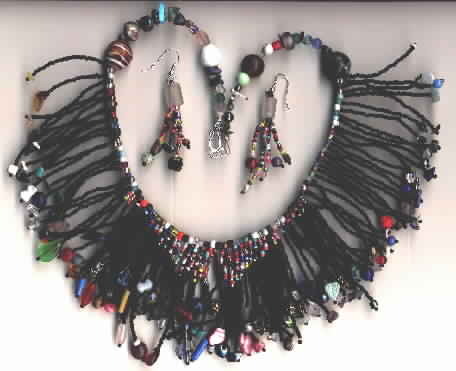 Ive always liked the idea and when I got my beads it seemed to be a workable concept. Well, projects always take longer than you think so after a week I decided I was going to finish this project today!!! Which explains the 1:20 am part. glue I have you have to push in the tip to get the glue out... I kept pressing but nothing seemed to be coming out so I realllly pressed hard! Well, I got some to finally come out. temporary attached to the necklace, I couldnt anyway. Well, Ive had fun before with super-glue, so I did have super-glue remover, but it was put away in the closet. The next problem was I couldnt reach the handle on the easy chair.. its on right side, which is the hand glued to the necklace, which I couldnt move down 2 far because the other end is in my teeth! I finally managed to release the foot of the chair with my left hand, got to the closet and made it to the sink. After a couple of minutes work, I managed to get my fingers unattached. then the necklace slid out of my teeth, crashing into the sink. ( I guess the majority of the weight of the necklace was on my hand so when I got my fingers free... crash! ) Well, my drain is very blessed, cause I lost a couple of beads down it! After quite abit of swearing, I did get the necklace finished without further mishap, and I think is captures the flavor of a prayer shaw quite nicely. Keep the faith! folks have visited this page since April 19th, 1999.